2. Should you buy it? While there are more powerful phones in the segment, the Nokia 3.1 Plus makes a space of its own. It's well built, has more than a day of battery life like the good old Nokia phones. Although, the 720p resolution display is a let down for that 6-inch size. Nokia kicked off the year with their new range of smartphones that ended up being appreciated by many. Essentially, all the smartphones were a revision of their initial line-up, which we can confidently call as real upgrades. If we compare the first Nokia handsets after revival to new phones like the Nokia 5.1 Plus, Nokia 6.1 Plus or the Nokia 7 Plus, it's evident that the company has been paying attention to the feedback and is working towards fixing them. The latest one to join the league is the Nokia 3.1 Plus. It succeeds the Nokia 3.1 and is aimed at the budget market, especially in the offline market. Similar to its siblings, the Plus variant of the 3.1 shares minimal similarity with its predecessor. There's a lot of new stuff starting with the design to the internals, but is it good enough for the price or should you look away? Let's find out. The Nokia 3.1 Plus is priced at Rs. 11,499 and comes in three colors – White, Blue and Baltic. The Nokia 8110 4G is priced at Rs. 5,999. Both the smartphones will be available across retail channels from October 19. The Nokia 3.1 Plus shares its design language with its newly launched siblings--the Nokia 5.1 Plus and Nokia 6.1 Plus. The difference here is in the material used. 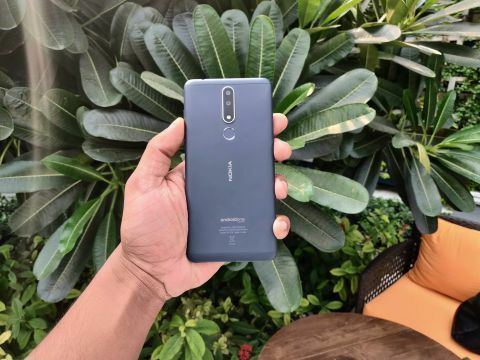 While the other two phones sport a metal and glass body, the Nokia 3.1 Plus comes packed in an aluminum shell with poly-carbonate on the top and bottom (which aids better network reception). The metal on the back has a soft touch with a matte finish with zero reflection of shine. The finish on the rear panel resembles more like the Nokia 6.1 or the 5.1 and it feels sleek for sure. Not just the looks, but the in-hand feel of the phone is premium. Building upon Nokia's assurance of making solid phones, the sturdy built on the Nokia 3.1 Plus can be felt when you hold it in hand. The chrome lining around the camera and fingerprint sensor does add up to the overall appearance of the phone. It will, however, get stained easily. It has curved edges all around, which makes it easy to grip and hold for long without digging into the fingers/palm. But do remember, it's slightly heavier at 180g. Although, the size of the phone does not qualify it to be called a handy device like the Nokia 6.1 Plus. There are two soft touch physical buttons on the right side--volume rocker and power/sleep key, and they are easily accessible and give a tactile feedback. The rear fingerprint scanner also falls nicely under the finger. The 3.5mm audio jack is on the top, while the micro USB port sits at the bottom with microphone and loudspeaker on its left and right respectively. There are two slots on the left side--one for a microSD card and the other for dual SIM cards. The front has a Nokia 7.1-like design, or say, a standard front frame with curved corners and an 18:9 display. A thick chin and forehead with an earpiece and front camera on top with the Nokia branding on the top right corner. Nokia is probably the only brand who has picked the odd spot for their logo on phones, others have either used the chin or haven't put the branding at all. With so many 18:9 display phones, it's never easy to know what phone it is. The new Nokia 3.1 Plus has a new HD+ IPS LCD screen with an 18:9 aspect ratio, an expected update since the Nokia 3.1. It is a bit taller with a 6-inch panel where vertical resolution is still 720p and the horizontal is 1,440p like the Nokia 3.1. The black levels are deep, but the maximum brightness is just above average for outdoor viewing. Sunlight legibility is underwhelming, but still on par with competing devices. Color accuracy can't be counted in the strong areas of the display, it has a Cyan, Blue-Greenish tint to it. For regular users, it's a very average display for multimedia and gaming, but full HD resolution is a bare minimum that we expected. We mentioned that the Nokia 3.1 Plus is slightly bulky, but that's because there's a juicy 3500mAh battery packed inside. Nokia promises 2-day battery on this phone, which is technically correct, but only if you don't stress your phone with power-intensive tasks and prolonged gaming. Power users can also get through a full 10 AM to 8 PM working day without a hitch. A full charge got us through a day's usage, which includes streaming, messaging, scrolling never-ending social media feed. It can be a dependable daily driver if the battery is your concern. The Nokia 3.1 Plus sports a dual rear camera setup- 13-megapixel primary lens with f/2.0 aperture + 5.0-megapixel secondary lens with f/2.4 aperture. The front-facing camera is an 8-megapixel shooter with f/2.2 aperture. The camera setup is mediocre and by that we mean, it can take convincing shots in daylight, but struggles in trickier lighting situations. Against direct sunlight, we sometimes got overexposure and blown out highlights, and in low light, some areas seemed to smudge out. It struggles with auto-focus in restricted light and also, you need to keep your hand steady to get a clear shot. Nonetheless, if you give it a good lighting and a steady pair of hand, you can get shareable shot for your Instagram feed. The 8MP front camera takes good selfies, but again, it's not the best in low light environments. Next Page Should you buy it?